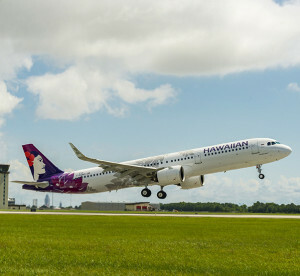 Hawaiian Airlines has taken delivery of its first U.S. produce A321 – also the first aircraft in the NEWO (new engine option) to be delivered from the Airbus U.S. manufacturing facility in Mobile, Ala.
Hawaiian Airlines has taken delivery of its first U.S.-produced A321. The aircraft, delivered from the Airbus U.S. Manufacturing Facility in Mobile, Ala., is also the first new engine option aircraft (NEO) delivered from Airbus’ U.S. facility. It is powered by a Pratt & Whitney PW1000G high-bypass geared turbofan engine. 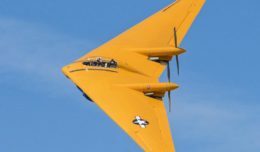 Executives and employees from Airbus and Hawaiian, and executives from Pratt & Whitney and UTC Aerospace Systems witnessed the milestone delivery. Hawaiian Airlines Executive Vice President and COO, Jon Snook, was also on hand for the delivery. Offering the lowest operating costs in its class, the A321neo operates 15 percent more efficiently than its A321ceo predecessor and by 2020 will operate at 20 percent more efficiently. Demonstrating the adage “The Sun Never Sets on Airbus Manufacturing,” Airbus aircraft are now produced around the clock, 24 hours a day, at facilities in Mobile, Ala.; Hamburg, Germany; Toulouse, France; and Tianjin, China.